This satin sash is perfect for completing a pirate or gondolier costume. They can also be used as an over sized aviator scarf for theatrical shows such as “You’re a Good Man Charlie Brown” and “Seussical the Musical”. 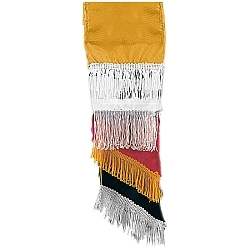 The satin sash has attached fringe, is available in black, gold, red, or white, and measures 82” long by 5” wide.